The area comprises of a landscaped area with lawns, seating and large area of stone sets. The area is used as an exhibition and events space. The main feature is a mirror pool, which shoots the highest fountain in any British city. There’s a walkway over the pool, and at one end features 40 low powered play fountains encouraging children to play in the fountain. The pool is drained everyday, this is also a key aspect as the area is used for events. We spoke about this in relation to the Dewsbury Road and Play Sculpture projects that The Tetley commissioned and how there was a desire from local councils for something that was useful, with benches, or something that can be used. These types of public sculpture are popular as they do more than one thing, and can engage many people, as does City Park in Bradford. Whilst I have not researched much of Bradford’s history of public art and public realm projects, something caught my eye this year when a new sculpture ‘Baby of the North’ was unveiled. Or not, as it may seem. Bradford City Council commissioned the sculpture entitled ‘Baby of the North’ which is a large, wire infant, with arms outstretched. It’s made form a thick silver metal with cogs and objects encased within it’s wirey frame. 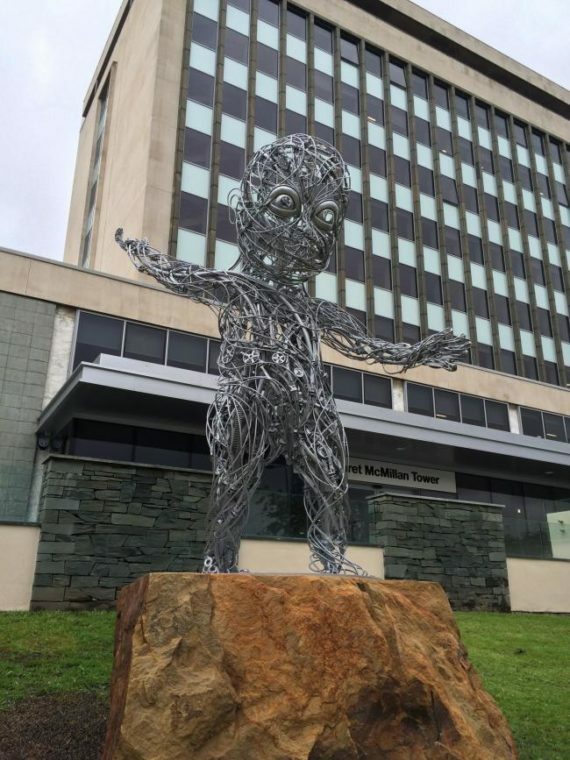 It sits outside the front of Margaret McMillan Tower, home of the council’s Children’s Services Department, and on a major roundabout in the city. It was created by Howarth based sculptor Craig Dyson. The sculpture has divided opinion, with a large amount of people feeling negative towards this new addition to the city. Initially, it had no official unveiling which has also angered the public, adding to this feeling that it had been ‘plonked’ in the city. Local food blogger ‘Food Legend’ writes about some public opinions here. Artist Craid Dyson, described it as ‘marmite’ but persists that when proper interpretation has been added that it will turn opinion. Apparently the sculpture has engaged over 1,000 local people, with them contributing to the design, which was made using old victorian looms, in reference to the cities textile heritage. I don’t really hate it, in fact I did really like it. It’s not huge. There’s something different about it, but not so much that would offend the public (or so you’d think) I think it might be something that will grow on Bradford. I sat down with Kenn Taylor, for a chat about participation, context and public art. Kenn Taylor is Head of Participation at The Tetley, and is leading on their part in the Dewsbury Road project. The Tetley have been asked to commission two new gateway sculptures for Dewsbury Road in Leeds. Among the group that choose the artist were local authorities, local businesses, traders and residents. They chose Chris Jarman, a Sheffield based artist, who’s work is concerned with imagination, colour and play. Kenn and The Tetley have been involved in various public art commissions over the course of their existence. In the Dewsbury Road project, the Tetley have been keen to work with an artist that delivers a certain amount of participation and public engagement around the project, something that was also a desire of the stakeholders. I wondered, does this make a piece of public art more valuable? Does it make a piece of art more likely to be accepted by the public? “It’s worth pointing out that I don’t necessarily say that a participatory based public art project is inherently superior. You have to be weary not to say that stuff that involves people is morally superior or aesthetically superior. Even if you engage hundreds of people at different ages, you’re still not engaging everyone. If you try to please everyone, I think, you often end up with stuff that isn’t great. It is a process. If you start from the perspective of trying to involve people, you at least get that sense of connection from those who engage. But you hopefully get a snapshot of what an area is like at a time. And it will only ever be a snapshot. But it’s more than not doing that. But you never know, people have dropped work into a place and it’s been very popular. We went down a particular process with Dewsbury road, which was developed in response to our commissioners desires. You have to be responsive, when you are a delivery organisation like ourselves. I believe in a robust process. You’re not going to please everyone, you will always have someone who feels that they weren’t involved, or that it’s not what they like. It is, by it’s nature, subjective. But if you can, involve enough people who feel they have a stake in it. I feel that they can then take ownership of it. “Public art exists within a particular context, it lacks the wider context of a gallery. It has to stand on it’s own two feet, regardless of how that manifests itself. How you do that depends on the context. If you’re putting something on a promenade, or on a business park, which is an area used by people. It’s sometimes easier to just commission someone to do something. It’s a different context when you are working in a residential area, an area where people lived and have lived for generations with layers and layers of history, and community and culture. That doesn’t mean to say you have to be a slave to the context, but I think ignoring the context and just plonking something down there is not necessarily the best way to go about it. Putting a sculpture on a former factory site is very different to putting it in a public park. In town, you can get away with things, because of the interaction with people. Even if someone’s like ‘What’s that?’ they say ‘It’s town’ People do feel a sense of ownership over their cities, they get annoyed when things go wrong. But it is more powerful in a district. And especially districts that have layers of culture and history. You can work with local artists, but I don’t think that’s always the best way. An artist coming in can, if done in the right way, can be really interesting for areas, and communities and even local artists to engage with. “I definitely feel the weight. I don’t feel the weight of pleasing everyone, because you can’t please everyone. You feel the weight of wanting to do a good job, this involves public money. I’m a firm advocate for the belief that public investment in the arts benefits a lot of people. I’m also an advocate that art can have a positive impact in a community. It’s not the single most important thing to human life. Considering the amount of process planning that feeds into the commissioning of these sculptures and public realm projects, I think this open approach is really significant. When I hear people gripe and moan about certain pieces of art that they love or loathe, I wonder if they might feel differently having known about the conversations behind the choices which led to this finished product. Without feeling that we have to sanitise and make transparent every process in local government, perhaps a little more education would help people love their local art more. Although I always think it’s better to feel strongly, whether negatively or positively, about a piece of art, than to feel nothing. Kenn also spoke to me about his interest in the art of Jacob Epstein. He talks about his sculpture ‘The Spirit of Liverpool Resurgent’ in this blog post about Lewis’ department store. In Chapeltown in Leeds, there are a number of public artworks. 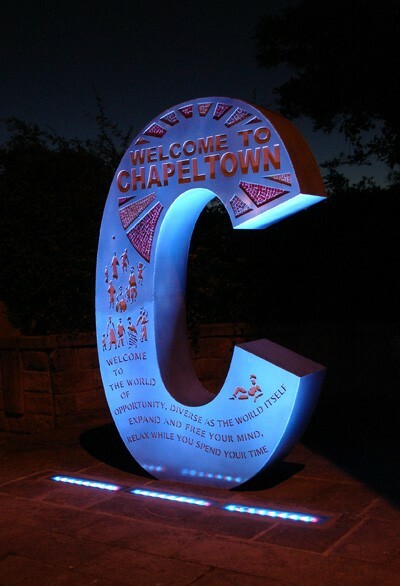 Most notably, what could also be called a ‘gateway’ sculpture (as Dewsbury road has been labelled) is the Chapeltown C. Created by Alan Pergusey, in collaboration with the public, from three proposed designs. Standing a little above head height, a large aluminium-clad C, which features motifs, text and mosaic. The Chapeltown C has a real community feel about it, it’s not pretentious art, it suits the area and the people of Chapeltown. Further up the road, a more recent installation of bright geometric patterns made out of tape, decorate a disused building site in a guerrilla style. The presence of East Street Arts in Chapeltown has made a big impact on the local art in the area and I feel that it brings vibrancy and celebrates this diverse part of the city. It’s no secret in Leeds that one neighbourhood sculpture seems to be a bone of contention. Perhaps down to a misunderstood process, rumour mill wound up by local press, or an overly simplistic approach to a design. Inhabiting a roundabout in an area of Leeds named Crossgates, lives a pair of brightly coloured gates. Although the colour of the gates, I believe, has changed since it’s installation in 2009 – it still angers local residents. Again, dubbed as a ‘Welcome Sculpture’ due to it’s location on a main thoroughfare into Leeds city centre. For this district, I feel, the question is now, how to create positive interactions with this work? I know that public artwork, especially those which are commissioned in residential areas, is incredibly difficult to appease everyone who sees it. Something I’ve observed (wether to do with public opinion and attitudes in the current climate, I’m not sure) is that the public are more keen to criticise and complain than think, observe, celebrate and understand a piece of artwork. This I can imagine is very difficult for artists and arts organisations that lead the commissioning of these works. 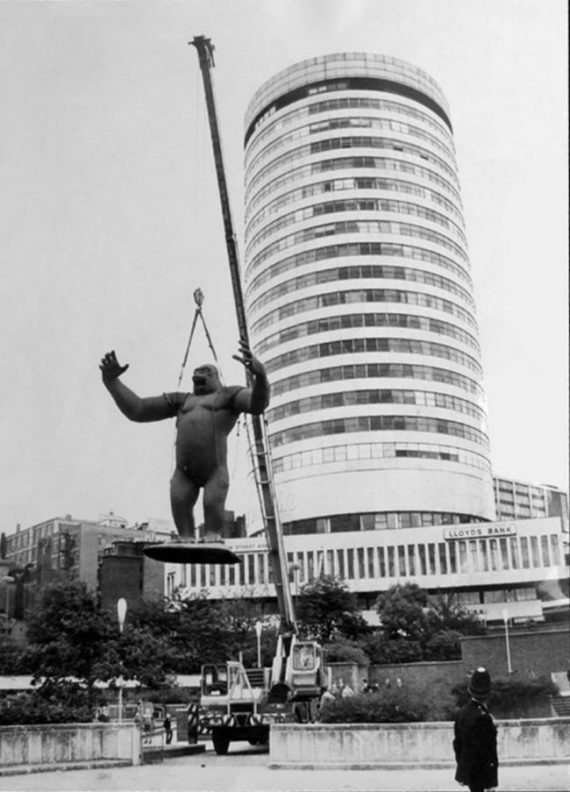 Currently on display outside the Henry Moore Institute in Leeds is Nicholas Monro’s ‘King Kong’, originally installed in 1972 in Birmingham as part of the ‘City Sculpture’ initiative commissioned by the Peter Stuyvesant Foundation. Today, it forms part of an exhibition about the Sculpture for Public Places scheme from 1972 and details some of the ground-breaking works which were commissioned. King Kong is striking, even in it’s position in the city centre, outside a major art gallery and it’s history is quite unusual. After being on display in Birmingham for six months, Birmingham City Council was offered the opportunity to purchase the work, but decided not to retain and instead it was sold for £3000 to a car dealership. This change in status from the public to the private usage is really intriguing for me and poses more questions for me about how an artwork’s context can change drastically. One area of Leeds which really appreciates the addition of public sculpture is the University of Leeds campus. Recently they have unveiled two new pieces of public art on their Leeds city centre campus, adding to a rich portfolio of pieces that adorn the area, and their most recent addition ‘Texere’ was installed in October this year. Texere, was created by artists Sue Lawty, in response to draw attention to Mitzi Cunliffe’s sculpture ‘Man Made Fibres’ a sculpture set into a nearby building and dates back to the 1950’s. Lawty’s piece Texere is installed into the paving at Lifton Place and reflects on the universities textile heritage, as does the earlier work by Mitzi Cunliffe. Blogger Workers Lunchtime has a great post about the lunchtime discussion with Sue Lawty earlier this year. Two new recent additions to the collection are ‘Sign for Art’ by Keith Wilson and ‘A Spire’ by Simon Fujiwara. Contemporary Art Society worked with the University of Leeds as consultants on this project, and to create a ‘University of Leeds Public Art Strategy’ The key aims of the strategy are to enable the University of Leeds to; Enhance their standing as an international institution, Achieve a world-leading research profile, Inspire students to develop their full potential and Increase their impact on a local to global scale. 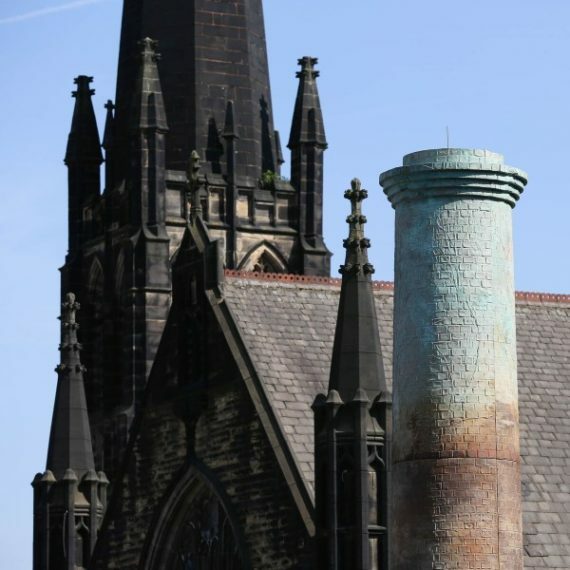 Simon Fujiwara’s ‘A Spire’ sits next to the recently built Laidlaw library, a chimney that towers just above the top of the building it is an ode to Leeds’ industrial history, depicting what once might have edged up above rooftops when Leeds was once described as the city of ‘100 chimneys’. Sitting out from the polished surfaces of the new building, it’s texture and colour contrasts noticeably. I was surprised to find out it was commissioned in tandem with the development of the building. Further into the Leeds University campus, and in a area that’s been given fresh landscaping sits ‘Sign for Art’ by Yorkshire-based artist Keith Wilson. 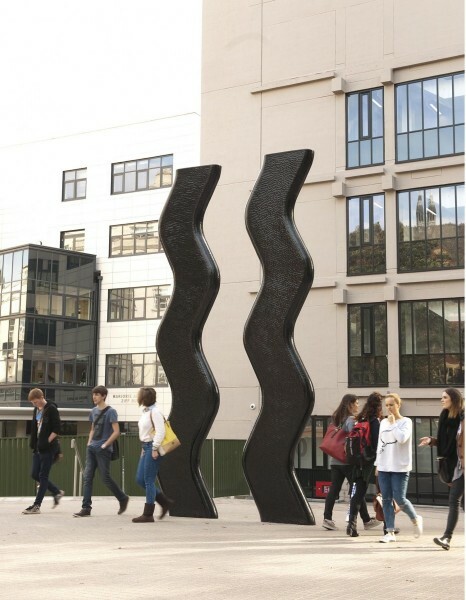 Standing at over 5m tall, the sculpture is two black thick wiggly lines cast in polyurethane elastomer, which gives the sculpture a distinctive rippled texture. It could be described as slightly monolithic however there is something mischievous and daring about Keith Wilson’s sculpture for me. The design was based on Wilson’s experience working as an art instructor for deaf-blind adults. “This modification of the British Sign Language sign, presumably derived from the making of a brushstroke, struck home, and stayed with me.” More information on the ‘Sign for Art’ can be found here. Along with the development of a new strategy for public art for the University of Leeds, they aim to establish a public art research institute, which will help to lead the way for public art practice. You can view the University of Leeds public art trail map here. Leeds List have also created a public art trail around the all three universities and civic area of the city, have a look at this here. Earlier this year, The Tetley, along with a board of community members, stakeholders and arts organisation members chose Chris Jarrett as the artist who would create two gateway sculptures for Dewsbury Road in Leeds. Dewsbury Road in South Leeds is a major travel route from the South into Leeds City Centre for commuters. Commissioning these sculptures comes in tandem with a significant investment into improvements to the road, with residents hoping this will ease traffic and enable smoother journeys to and from the city for drivers and pedestrians. Local businesses have formed a Town Team which meets regularly to give strategic leadership in the area, helping promote trade, and have a say in the improvements to the area. Among road improvements, the regeneration also hopes to help the area feel safer, upgrade the aesthetic qualities of Dewsbury road and introduce environmental aspects such as a green areas and trees. Sheffield-based Chris Jarrett will be creating the final designs for two road-side sculptures. He aims to engage local residents in a series of workshops, where they will have a say in the final colour way and design of the sculpture. Chris is fascinated by colour theory and this has a strong influence in his work. He has often created outdoor installations for the public and private sphere, his work is colourful, mischievous and playful. You can see some of his work here. What I can imagine is a great match for Dewsbury Road. Currently draft designs for Dewsbury road have been approved and the next stage (possibly my favourite part) is working with the public. I joined Chris, this winter on one of over 8 public consultation / creative workshops. Here, he talks to adult members of an assisted living facility about colour theory and shapes. 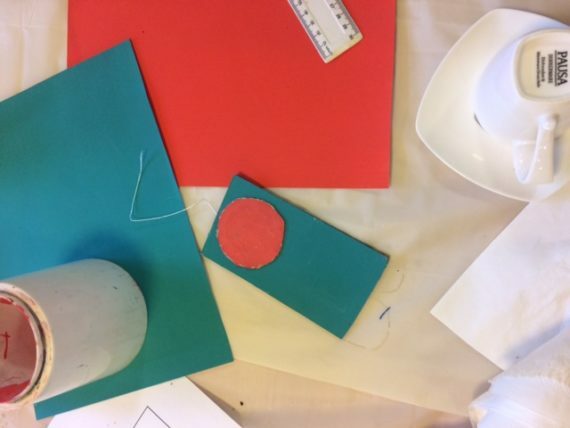 We then go on to create 2D maquette’s of the final product in our favourite colour and shape combinations. The favourite colour combination, at the end of all the engagement workshops will be chosen as the final design. The ideas is simple, and involves minimal effort from a group. From all that were made, I can’t predict what the public will choose out of a possible 30-something combinations of shapes and colours. I look forward to see Chris’ final designs early in the near year, before the sculptures completion in 2017.